Roel Sarmago was born in Cebu City, Philippines. His parents immigrated to Canada along with his older sister when Roel was only one year old. He currently lives in Mississauga just outside of Toronto in the province of Ontario. There, he lives with his wife and son and, at the time of this writing, they are expecting their second child. Roel’s passion has always been to empower individuals with the right knowledge, tools and inspiration to take action towards achieving their dreams. Early on in his working years, Roel realized that those dreams often required money. Thus, his life’s work soon evolved into helping people achieve their dreams through the most effective and efficient personal financial management strategies possible. Roel's passions are reflected in the roles he plays as an author, Financial Coach and licensed Mortgage Agent. On several occasions, Roel has been invited to share his passion at the Schulich School of Business at York University and at the University of Toronto Investment Society, and Management & Economics Students' Association. Roel is available for speaking engagements, group training and one-on-one coaching on real estate investing, personal development and personal finance. Undiscovered RichesTM reads like you are having a fireside chat with a very knowledgeable old friend—albeit one with a slightly strange sense of humor. This book offers an eye-opening, myth-busting critique of the top 7 most commonly held beliefs about money. 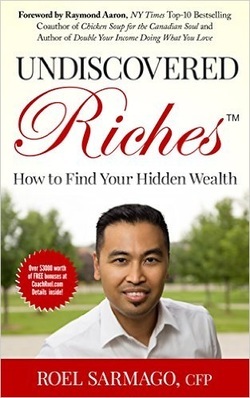 In his conversational, easy-to-read style, Roel Sarmago shines a light on how these money myths have been blocking your way to wealth for far too long. He shares practical strategies for paying less tax and making more money. This book is a must-read if you are seeking to gain more control over your time and how you spend it. You will discover wealth and riches you didn’t even know you had by steering clear of these pitfalls: • The Time is Money Myth • The Saving (and Savings) Myth • The Budgeting Myth • The Debt Myth • The Retirement Myth • The Net Worth Myth • The Home Equity Myth.